Following on from the same developer’s Desert Treasure (but with a ‘2’ added - see what they did there? ), this revamp of online slot developer Playtech’s much-loved slot sees the same gorgeous graphics, slick gameplay and theme as its predecessor, but with some tasty added features. So, will Desert Treasure 2 leave you dry or is it an oasis of calm? 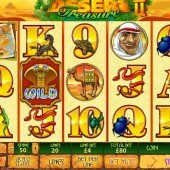 A 5-reel, 10-payline slot, if the extra features of Desert Treasure 2 don’t entice you, the $100,000 maximum jackpot surely will. Set in a sandy desert, the game puts you straight on the set of a David Lean film: a stylish Arabic treasure hunter, camels, the oasis, a sultry desert maiden, maps and compasses, and the all-important spitting cobra fill the reels to give you a feel for the romance of the Middle East. Watch Out For the Expanding Cobra Wild! That fearsome cobra is the key in this game as he acts as the Wild. He’ll replace all other symbols other than the scattered Harem girl and the Bonus map symbol. The cobra Wild is expanding too, and can extend his scaly neck across all the reels. Speaking of the gorgeous desert girl, three or more of them anywhere will bring you quite a good deal – 15 free spins which will see all your prizes multiplied by 2. And the best thing of all about this feature is that the free spins can be retriggered infinitely – just get the same three or more scatters in any position. Look out for the map ‘n’ compass symbol, as getting three, four or five of these on active pay-lines will trigger the bonus game. In the first part you’ll be presented with the familiar ‘Pick the Box’ game where you get to choose from a selection of mysterious boxes. Choose wisely and you’ll be off to the second bonus game. Here you can get to pick between two locations – a tent and a hidden chamber. Another range of items awaits. Choose up to five to win cash bonuses. Slots developers seem to like a bit of sand in their games, as anyone who’s played an Egyptian-themed game will attest. 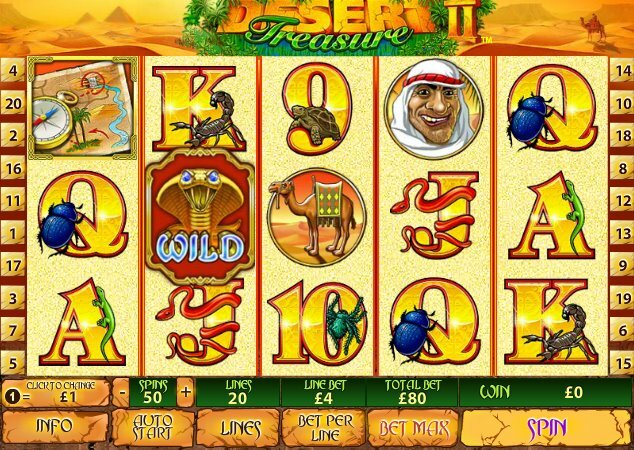 There are also plenty of desert-themed slots out there, like the progressive fun of Playtech’s death-valley themed slot, Diamond Valley, or RivalGaming’s Arabian-themed game, Crazy Camel Cash, and both of these are perfectly acceptable alternatives. If you like reliable classics with lots of bonus features, then “sheik yer bootie” and add Desert Treasure 2 to your list of must-plays.